3 Ways to Cope With Test Stress | Go From Stress To Success! Almost every student I’ve ever met stresses out about tests. Whether it’s a quiz, a midterm, or a final exam, it’s one of the most stressful things students cope with. And it’s no wonder – we live in a society that prioritizes test scores! But research has also shown that going into a test stressed makes it less likely you’ll do well. In some cases, such as the SATs and ACTs, test stress can even invalidate your results. So being stressed when you approach a test is, at best, not optimal. So how do you make tests less stressful? Many of us have a knee-jerk reaction to the idea of being tested. 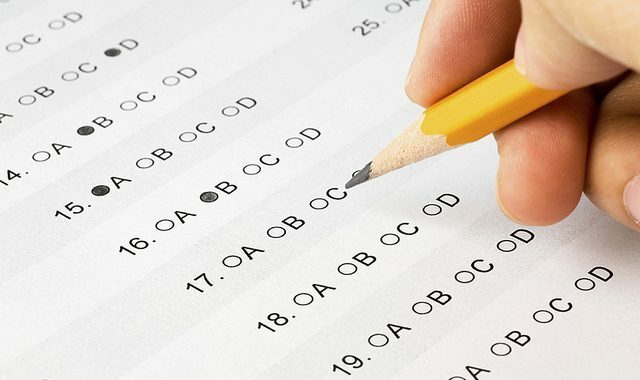 There’s just something about the words “test,” “exam,” and even “quiz” that strike anxiety into the hearts of most people. These words make us feel like we’re going to be judged and somehow found lacking if we don’t ace the test. They also make us focus on the score we’re earning, instead of the material we’re learning. But there are other ways to look at tests. For example, we could frame the test as “seeing what I know and understand,” instead of “if I don’t pass this I’m a failure.” We can look at the test as a way of giving feedback to the teacher about what we know and what’s still giving us trouble. We can look at a quiz as a small step on the road to mastery. We can even see final exams as a way of communicating our knowledge, rather than being put on the spot and interrogated. Think of some ways to look at the test as part of your learning process, instead of focusing only on your score. This should reduce your test stress. It’s not just for the Boy Scouts anymore – being prepared will go a long way toward reducing your stress around a test. But what does it mean to be prepared? First, make a list of every topic you’ll need to know. Then check this with the teacher or your classmates. Are you missing anything that’s going to be covered? Fill in the holes in your notes and your list so that you know exactly what you need to study before you get started studying. Second, find at least four different ways to study for the exam. This could be reading and re-reading your book and your notes, rewriting your notes, making flash cards, using flash cards, working in study groups – there are many different ways to interact with the course material. The more different ways you use, the more chances you have to get the information into your brain where you can use it. Third, find two ways you’re going to check your knowledge. This could be handing your flash cards to a parent or a friend and having them quiz you. 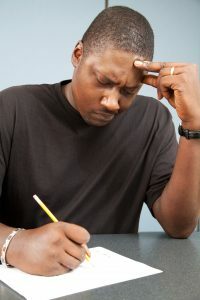 It could be creating a self-quiz, waiting at least 24 hours, taking the quiz and checking what you still need to learn. When you can consistently get 90% of the questions correct, you can be pretty confident you’ve got it down well enough that you’ll do well on the exam. If you can do these things, you’re probably pretty prepared, and you can go into the test feeling confident about your ability to knock it out of the park. It may sound like a tall order, but there are several ways to relax yourself during the exam. First, take steps to make sure you’re ready. Get a full night’s sleep the night before. If you’re taking the exam in the morning, have a low-carb breakfast with plenty of protein in it (and if you’re taking it in the afternoon, make sure you eat a decent lunch). Try to avoid having more than one cup of coffee or can of soda before the exam – drink water instead. Finally, if you feel yourself tensing up or your thoughts begin to race, put your pen or pencil down and give yourself four deep breaths. Breathe in for a slow count of four, hold it for a slow count of four, breathe out for a slow count of four, and hold that for a slow count of four. Do this four times. This will calm your body down, which will allow your brain to cancel any alerts. If you reframe how you think about exams, make sure you’re reasonably prepared, and take steps to keep yourself calm during the test, you’ll reduce a lot of the stress around tests, quizzes, and exams. Talk to yourself about the exam the same way you’d encourage a friend – and make sure you’ve done the work you need to do in order to pass it. If you do these things, you’ll probably do just fine – and your test stress, if not gone, will at least become manageable! Posted in Tests and Exams.